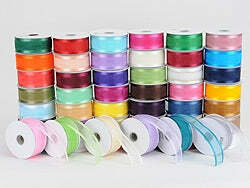 Nowadays, organza ribbons two striped satin edges gaining a lot of popularity which no other decorative item has. It is used to add a creative and artistic look to any gift wrapping or any decoration material. Though, it can also be utilized in the various accessories for kids. Just because of the two stripes of satin as the border of the organza ribbon that provides very charming look. At bbcrafts.com, with our Organza Two striped ribbon, we are here to give you the rich finish to your accessories decorations. You will surely find the best quality product at the reasonable price that suits your requirements. It is just perfect material for you to use for any decoration purposes like it can be wedding decoration, wrapping the gift or much more. Most of you decorate your gift by simple ribbon but if you want to give an incredibly beautiful look to your gift or fabric then add satin edges to organza ribbons that are the finest idea. Because the effect you can get would be different and unique, that can make forget everything else.